Which plastic materials are suitable for laser cutting? Acrylic is the best when it comes to quantities that are laser-cut, partly because the result is excellent and partly because of the propagation of acrylic. Various foil materials are also suitable, but you often have to compromise with technical materials. New materials are constantly being developed, and they react differently to laser cutting, so it is in fact impossible to keep count and predict results. Often, it's all about testing, in order to determine which materials are most suitable for laser cutting. It is possible to laser cut acrylic in sheet thicknesses to 25mm. Clear acrylic is cut completely transparent and does hardly require any post-processing. Extruded acrylic gets a small burr on one side upon laser cutting, whereas cast acrylic is completely free of burrs. Coloured acrylics are mostly suitable for laser cutting, presenting excellent results. The tolerances when laser cutting plexiglass depend on the sheet thickness, since laser-cut cuts are not completely vertical. 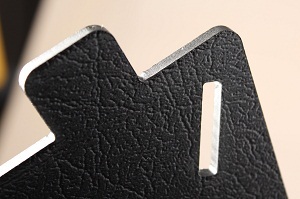 Sheets with a thickness of 1mm can be cut with tolerances of +/-0.1mm. Then the tolerances increase to +/-0.25mm for a 8mm sheet and +/-0.7mm for 20mm. Foils for ex. overlays, spacers, streamers and isolators also present excellent laser cutting results. The alternative is either die-cutting or cutting with plotter. Both methods are generally faster, but leave pressure marks along the cut. They are further limited by hole distances and hole sizes. Laser cutting hardly sets any limitations in terms of geometry and does not leave pressure marks. 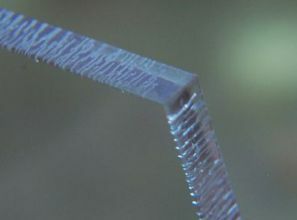 It is possible to laser-cut through several layers of material, for instance PC or PS with adhesive, but also polyester, such as mylar, petg, axpet, vivak. The foils should preferably be thicker than 1mm. The silk screen print itself is not affected by the laser cutting, meaning that laser cutting on top of the print is possible, without discoloration, crackling or any other damage. Thus, it is a good idea to print the sheets/foils prior to laser cutting. If the sheets are laser-cut first, problems with the chemical composition from the print colour and tensions from the laser cutting may arise. 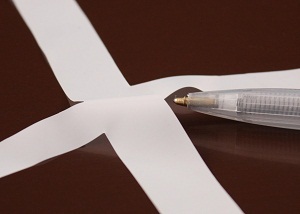 Many sheets and foils must be cut accurately in terms of silk screen printing, since the sheets may differ. In collaboration with Trivision, we have developed a vision system that makes it possible to adjust the cutting area to the print automatically. A large variety of technical plastic materials are suitable for laser cutting, if the sheet thickness does not exceed 1mm. 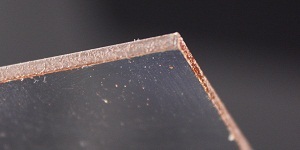 Thicker sheets may experience problems with quality and tolerances, since plastic often melts along the cut and it generates fumes that require special ventilation measures and filtering. Technical plastic is nevertheless often subject to laser cutting, due to the geometry of items, or in order to reduce costs. At Induflex, we no longer use technical plastic for laser cutting, since we can achieve the same quality with milling or water jet cutting. Tensions in plastic can cause problems, if not handled correctly. Here 3mm clear laser-cut acrylic; dipped into acetone after cutting. The same result is achieved with with ethanol and petrol. Polycarbonate sheets are utterly unsuitable for laser cutting. The surface turns brown and toxic fumes arise.